I love this. It’s called the Babykeeper Basic. 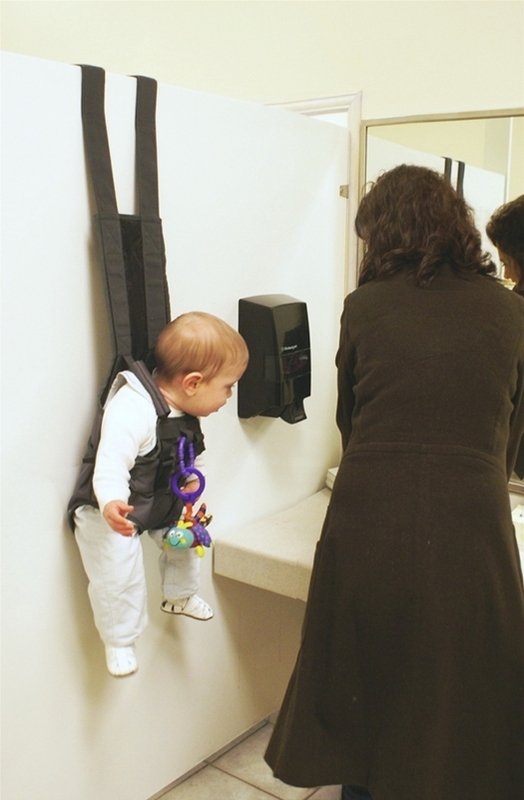 Its apparently for when you’re holding a baby and yet need to wash your hands in a public bathroom. That is quite a specific purpose. I guess it’d be handy for when you’re shopping and your pram or baby-sling goes missing somehow (perhaps they get eaten by a rogue goat). But luckily you had packed a cumbersome bathroom-baby-wallhanger-contraption instead. Actually, they should advertise this product as “Goat Resistant”. Just an idea. - Use it on your clothes line. Then, while you’re hanging out your washing you can keep an eye on junior! Plus if there’s no washing, your baby can simply act as a scarecrow for your garden. - It’s a novel place for ‘time out’. Instead of the Naughty Step, it’s the Naughty Wall. - Use during a cocktail party. You can then have canapes in one hand, champagne in the other, and baby hanging off a door. Everyone’s happy. Pfff. I prefer the Babykeeper Complicated, personally. 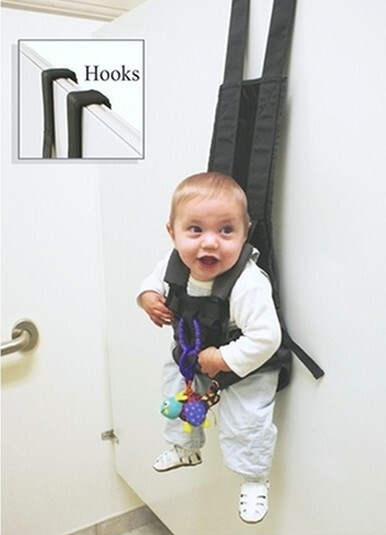 It has so many straps and dooziwhatsits that you end up throwing it against a wall in frustration and plonk your kid wherever. Like the Basic, it’s also handy at cocktail parties. I like the Babykeeper Ultra-Basic which is just 2 large elastic bands. whatever happened to crawling around on the floor and eating dirt? I agree. If it’s good enough for mum, it’s good enough for baby too.